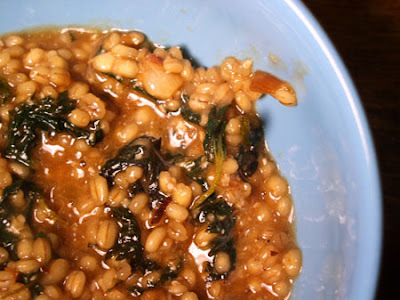 Barley Risotto with Nettle Leaves and Wild Onions. Last week, when we downed our sticky yet filling Nettle Pudding, we all agreed it could probably be adapted into something more appetizing. Inspired by the 8,000 year old recipe. With additional inspiration from Martha Stewart’s Parmesan-Carrot Risotto. 1. Microwave stock until steaming. Set aside. 2. 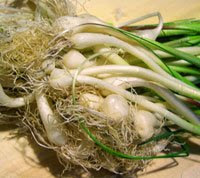 Wash the wild onions well, and prepare by slicing off the roots and tough green leaves. It should look similar to a pearl onion. 3. Prepare the nettle by plucking the leaves off of the stem. Remember to wear gloves! Rinse the leaves well. 4. Brown the onions in a skillet with 1tbsp butter and 1tbsp olive oil, seasoned with salt and pepper. Cook until soft, about 5-7 minutes. 5. Add the nettle leaves and saute 1-2 minutes, until wilted. 6. Add the barley to the skillet and mix with other ingredients. 7. Add the 1/2 cup booze. I ended up using sweet vermouth because there was nothing else in the house, but a red wine would probably work best. Stir, and cook until booze is absorbed. 8. Add 1 cup hot broth; simmer over medium-low, stirring frequently until mostly absorbed, 10-12 minutes. Continue to add broth, one cup at a time, stirring occasionally until it is mostly absorbed. Cook until rice is creamy and tender, 20-30min. 9. Remove from heat and stir in Parmesan and remaining butter. This is very rich; I’d recommend it as a side served with more vegetables, or with meat.